Welcome to our updated resources portion of the website. We hope you will find it useful. This page lists greyhound adoption resources, books (greyhound owner manuals), CG magazine, Greyhound Network News, greyhound discussion lists, greyhound informational websites, and how to research your greyhound’s history. 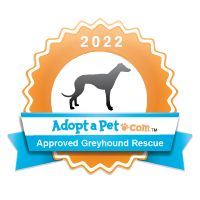 Lots of information about adopting greyhounds. Great information about the special health needs of greyhounds and tips for new owners. The retired racer’s bible filled with information to better understand this special breed by Cynthia Branigan. Everything there is to know about greyhounds but were afraid to ask. Happy reading. CG Magazine (Celebrating Greyhounds) is an award winning breed specific glossy magazine that is all about greyhounds. Every issue is packed with behavioral, medical, heart-warming and humorous articles. Published quarterly, it’s only available via subscription and all profits benefit from the Adopt-a-Greyhound Project. The biggest discussion list around with about 3,000 members worldwide. Opt for the digest version. A wonderful resource for new adopters as well as seasoned greyhound owners. The GreyTalk community is a friendly group of over 400 greyhound lovers who love to share stories, ideas, and pictures of their hounds. All About Greyhounds: excellent information about retired racers! So what is Valley Fever and how do you know that your dog may have contracted this disease? Suzanne Stack, D.V.M./Arizona offers a wealth of information about your greyhound’s health including the hard to interpret blood panel. Galgos del Sol is a registered, charity in Murcia, Spain. GdS rescues and rehabilitates abandoned and injured galgos for placement in forever homes in the UK, Europe, and US. In Spain, these hounds are bred solely for hunting, and thousands of galgos are abandoned or killed annually at the end of each short season. Scooby is an organization devoted to rescuing the Galgos of Spain and places them for adoption. Greyhound Data presents the largest online database of racing greyhounds. LostPetUSA.net BISSELL knows that your pets are important members of your families. Losing a pet can be one of the scariest situations you experience as a pet parent. Fortunately, LostPetUSA.net has the essential tools to help reunite lost and found pets with their families. The free online and mobile service offers a searchable, nationwide registry to connect owners and finders with recently reported lost & found pets, as well as many resources and tools for pet parents to use if their beloved pet ever becomes astray. Locally-owned by greyhound-friendly Kevin Sarullo, this midtown shop will pamper your hound in style; appointments required but you can walk in to have your hound’s nails trimmed. Located at 2549 E Broadway; 323-9599. Kevin has trimmed nails at various AGR events. Doggie Diva Pet Care offers clients freedom and peace of mind about traveling and leaving their pets home while they are away. There's no need to give up your beloved pets when faced with a move. Here's a resource to help you find pet friendly apartment housing. Find pet-friendly housing in Tucson!